Wand showed up in the Entry and blew the doors off the place. A technically very talented band, Wand is able to transfer their skills from the studio to the stage better than a vast majority of similar bands. Miguel is an incredible performer with magnificent stage presence. His only real negative is a tendency towards unnecessary, and eye rolling, preachiness. The show was moved from First Avenue due to a ceiling collapse, otherwise it would likely rank higher. There are few things in this world as invigorating as a truly blazing punk show, and White Lung qualifies. Mish Way is a banshee of a frontwoman, and the band absolutely crushed it. It’s difficult to comprehend the vast number of great songs in Hot Chip’s catalog until you hear them all at the same time. It makes for a seriously fun show, especially when capped off by a Springsteen cover. TV on the Radio doesn’t mess around with gimmicks. They just take the stage and rock the audience’s socks off. In this instance, however, they did close with one of the best of the many ‘Purple Rain’ covers played in the Mainroom. 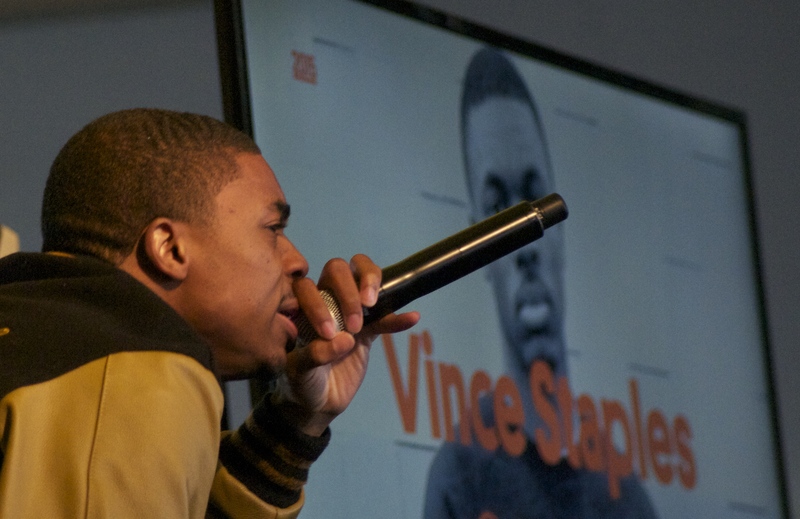 On Summertime ’06, Vince Staples comes across as a survivor. He’s a guy who can grow up surrounded by pain, but make it through. In concert it becomes clear that in addition to this, he’s a truly funny guy, and the combination of humor and pain makes for a fascinating show. Algiers played this show before about 30 people, but you wouldn’t have known it from their performance. The energy level was off the charts (especially from bassist Ryan Mahan), which added to the already existing urgency in the band’s gospel, post punk. One of the best rock bands going right now, Titus Andronicus always brings it live, and the TMLT tour was no exception (even if they were distracted by the Mets in the World Series). A great rock show with a crowd that couldn’t get enough. A ballroom in Milwaukee is no Midway Stadium filled to bursting, but any opportunity to see Paul Westerberg, Tommy Stinson, and crew play those songs is a gift. Sadly we might have seen the last of The Mats. A performance of Big Star’s Third, plus the ‘hits,’ featuring Big Star’s Jody Stephenson, The dB’s Chris Stamey, The Posies’ Ken Stringfellow, R.E.M.’s Mike Mills, and many, many others. It was an absolute joy to hear this songs live. RtJ has done basically the same show for the last two years, but it doesn’t matter. The energy and comradery between Killer Mike and El-P is overwhelming and infectious. Add that to the fire that is RtJ songs, and it’s a great night no matter how many times you’ve seen it. Stevie Wonder brought more than 40 musicians to the stage, including India.Arie, and performed Songs in the Key of Life in its entirety before finishing with some hits, including a show stopping performance of “Superstition”. If it hadn’t been in an arena this would be #1 by far. Four old German guys in funny spandex outfits standing in front of early 80s 3D technology shouldn’t be great, but it absolutely is. Then they brought out the robots. Kraftwerk are true legends and they do what they do very, very well. They haven’t lost anything. Carrie Brownstein still wails on the guitar while doing high kicks, Janet Weiss still crushes the drums, and Corin Tucker’s voice might be better than ever (she was especially devastating on “Gimme Love”). The crowd was in ecstasy throughout. The hype surrounding a Father John Misty live show is immense. It would be very easy for Josh Tillman to dial it back a bit and still leave the crowd happy, but he refuses to do so. He puts absolutely everything he has into every note, every gesture, and every word with the crowd. It’s a remarkable thing to witness, and if you haven’t yet done so, you must.